Today was Zack's first day of third grade. This is a BIG year for him ~ the first year of the Virginia Standards of Learning Tests. Being a former third grade teacher, I know exactly what to expect, and we have already started to prepare. So, this picture does not show how he really feels about going to school. All of the kids at the bus stop! He is actually quite excited to go back to school and see his friends. I am so glad for that! By the time he got on the bus, he was all smiles! He came home from school happy as can be. I think he is going to like third grade!! I am so envious of those who get to have fabric on their bulletin boards. Our fire marshal won't let us have it, period! No curtains, nothing! I don't quite understand. Doesn't paper burn too? So, here is my bulletin board with pitiful old paper! We are lucky to have monstrous closets. I am supposed to share it, but no one is next door, so I spread out until they move someone in. Then I will squeeze it all together! See the pencil sharpener? I have carried that around the school for others to use because their brand new sharpeners don't work! Even a PTA volunteer used it and decided that every teacher needs one. She was able to get three times as many pencils sharpened in half the time as the electric sharpeners. Go to Classroom Friendly Supplies to get your own Quietest Pencil Sharpener. You won't regret it, until everyone else wants to use yours, and you have to hunt it down! And, yes the candy is a must! I actually won that during our "Handbook Jeopardy"! I love my little room. It is cozy and fun, and now I can't wait to get my intervention groups to work in here! 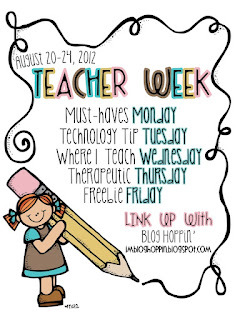 I am linking up with Blog Hoppin' for Teacher Week's "Where I Teach Wednesday". Go check it out! Thanks for sharing your room! I found your blog on the Blog Hop and I am a new VA blogger :)! I am your newest follower. So glad you stopped by! What is your blog link, so I can check it out! Oh, I know I shouldn't be jealous, but it is so hard not to be jealous of that closet! The closets are wonderful! It is nice to have a space to store things. I just found your cute blog through Blog Hoppin' and I'm a new follower. I love your thinking map posters! Did you make them?